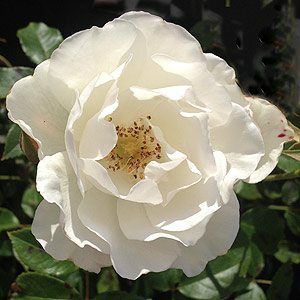 Some of the most popular roses of all time are the White Iceberg Roses. Pure white flowers, repeat flowering, disease resistant and easy care and it comes as a bush rose, a standard and a climbing type. So whats not to like about Iceberg Roses ? Bred in 1958 this is a long flowering rose, in the right climate with good light it will flower for 8 – 10 months, the warmer the climate the longer the flowering period. Perhaps the only downside of the Iceberg Rose is the popularity, if you are looking for something different, then the White Iceberg is not the rose for you however the Burgundy Iceberg Rose might be just the ticket. 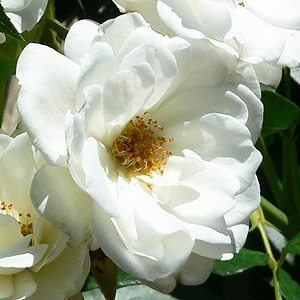 Available as a standard, as a bush and as a climbing rose the Iceberg is certainly versatile. As a standard it is planted to line entrance pathways as well as being popular in commercial landscaping. The standard varieties are grafted so it is easy to get consistent heights. The bush types are vigorous and can be used as climbers while weeping specimens are also available. And just to add a little more, you can also get a red iceberg rose and a pink one as well. The flowers are open around 4 – 6cm in diameter, fragrant and depending on the climate the Iceberg will flower almost year round.. In France the Iceberg Rose is known as Snow Fairy (Fée des Neiges) and in Germany Snow White (Schneewittchen), So here we have it, the most popular rose of all time, a Floribunda type rose with cultivar name ‘Iceberg’. One of the beauties of this rose is how little maintenance it really needs. If you start with a sunny position and a well prepared soil you will have few problems. We suggest a specialist rose fertiliser every 5 weeks from spring through summer. Lots of talk about watering and irrigation, unless you live in a very dry area you will not need it, roses are remarkably tough. Mulch in spring to maintain moisture and a cool root run and should have few problems. You will sometimes notice a few pink spots on the petals of Iceberg Roses after rain, this seems to be normal. Very much the same as any other rose, prune by removing and dead or damaged wood. Remove growth that crowds the centre of the bush and then prune to shape and size, in general cut back by 1/3 each year and deadhead in summer. Although they are pretty much problem free, in poor conditions you can get the normal issues. Mildew, black spot and aphids. Good air circulation and the usual preventative measures should solve the problems. Can you grow an Iceberg rose in shade ? The general rule for roses is 6 hours of sun a day, although the Iceberg variety will cope with a little less than this you will find that flowering is less prolific as the amount of light decreases. However this is a floribunda type and they do cope better in low light than many.